Lok Janshakti Party chief Ram Vilas Paswan has fielded himself and two close relatives including his son and brother, to contest the Lok Sabha polls in Bihar. Announcing the names of candidates for 6 of the 7 constituencies the LJP will contest under its alliance with the BJP, Ram Vilas Paswan said he will contest from his traditional seat Hajipur and decided to field his son from Jamui seat and his brother from Samastipur seat. Chirag Paswan, an actor-turned-politician, will contest from Jamui, a Maoist affected constituency. Ram Vilas Paswan’s brother Ramchander Paswan will contest from Samastipur seat. All three parliamentary seats are reserved for the scheduled caste. Lalu fielded his daughter Misa Bharti as his party nominee from the Patliputra seat in Patna, and his wife and former chief minister Rabri Devi from the Saran seat. In the 2009 Lok Sabha polls, Ram Vilas Paswan and his brother were defeated by the ruling Janata Dal-United. There was no member of Parliament from the party in the Lok Sabha. 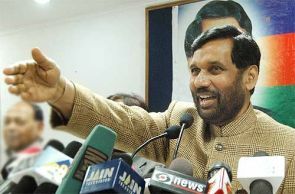 But this time around Paswan's LJP has joined hands with the BJP and they hope to put on a good performance. The LJP has also fielded a Bahubali Rama Singh from Vaishali seat and Veena Devi, wife of another Bahubali Surajbhan Singh, from Munger seat. Paswan also held out an olive branch to Ram Kripal Yadav, the leader of the Lalu Prasad Yadav-led RJD, on a day when the latter resigned from all party posts over an issue involving Lok Sabha tickets. Paswan, whose party recently allied with BJP for the upcoming parliamentary polls after falling out with RJD and Congress, hailed Ram Kripal as a "friend" and also said he was "welcome" to join LJP or NDA if he so chooses. "Ram Kripal ji a very good leader. He was a very senior leader of RJD... If a person like him was humiliated there, you can well imagine what happened to LJP. He was like a family member (for Lalu Prasad). We were just a party," Paswan said at a press conference.